Minnesota golf on March 11. Still shocked. Growing up in west central Minnesota, the goal was always to have played golf before someone got the Green Jacket at the Masters. Usually it happened, but it wasn’t always a given. I remember very clearly playing nine holes on a cold April Sunday in 1986 on the day that Jack Nicklaus won the Masters. I’m pretty sure there were years when we didn’t put a tee in the ground until after taxes were due. But since moving back to Minnesota in 2000, things have changed. While there have been springs that were slow to arrive — that was certainly the case a year ago — but there have been years in which March golf has been a reality. In 2007, I remember playing at Mississippi Dunes in late March, the day after Tubby Smith was announced as the Gophers head basketball coach. A year later, a made a March trip to St. Cloud to tee it up with my friend Tom at a bad course called Sartell Golf Club (which has now gone from 18 holes to 9 holes because so few people played there). 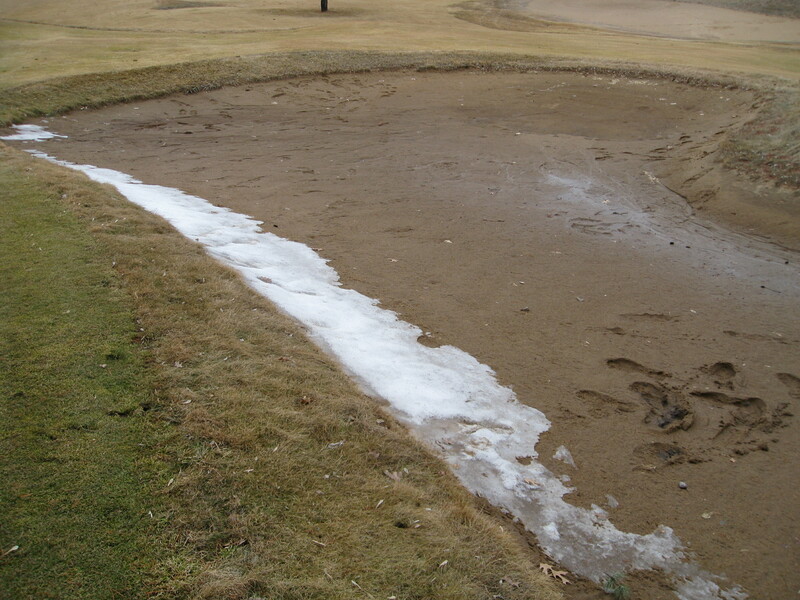 Two years ago, in 2010, was the greatest early spring here for golfers. 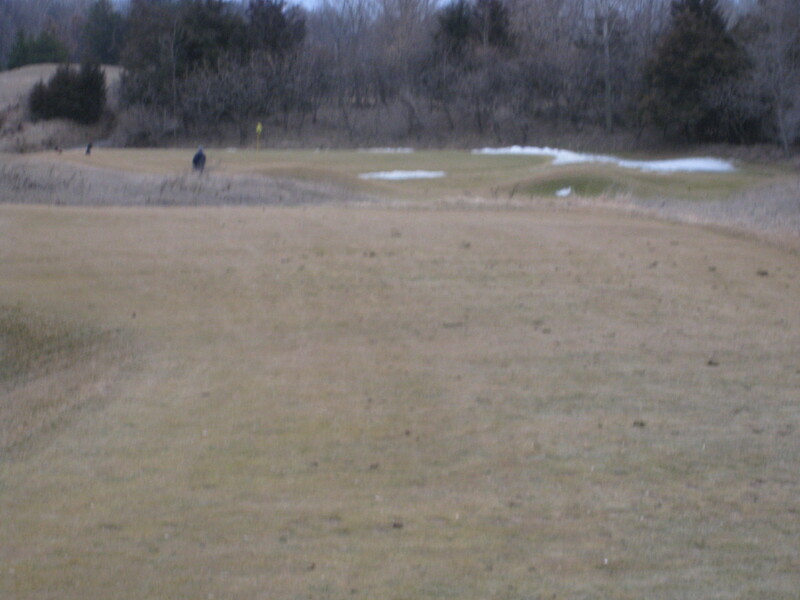 Pretty much every course in the Twin Cities opened in March, including private clubs. At least when it comes to golf, climate change is a reality. All of that said, I still can’t believe I just played 18 holes of real/non-simulator golf. In Minnesota. On March 11. But that’s exactly what happened on Sunday. 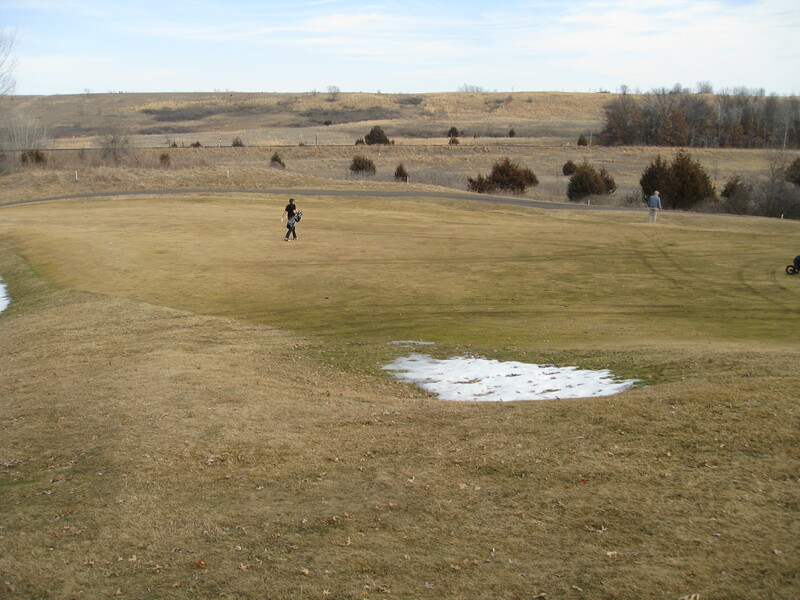 Even with the warm winter and the melting snow, I thought we were still several days away from courses in the Twin Cities opening for the season. But late last week, Mississippi Dunes announced that it was going to open this weekend for a shotgun start each weekend afternoon. They ended up adding a morning shotgun for Sunday. Now, I’m not really a huge fan of The Dunes. While there are some good holes on the course, there is too much stupidity out there for my taste. Too many blind shots, too many tee shots where you don’t really know where to hit it and too many wild greens that lead to bad breaks (though the free yardage books that are new from my last round there do help). I also don’t like that a place that is officially called “Mississippi Dunes Golf Links” is a golf course that features a overwhelming number of elevated greens in which the ball needs to be flown onto the green. — a contradiction considering how “links” golf is supposed to encourage the ground game and options of how to get the ball close. 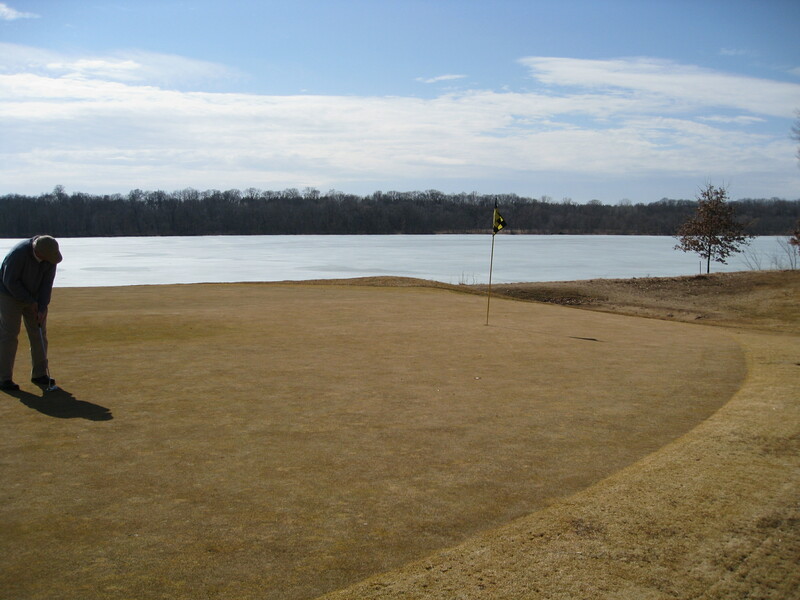 But, the course has a great advantage of being built on some wonderful sandy soil along the Mississippi River. Drainage is seemingly automatic. Now if only a real architect had been hired to build the course instead of the owner’s DIY bulldozer project. I teed it up with friends Jason, Rick and Ryan. We had a nice time despite the pace of play. Everyone in our group made at least one birdie (something that can’t always be said of a summer round) and everyone made some awful swings. In an effort to squeeze as much possible revenue out of a record-high-temp Sunday, let’s just say the management put a few too many golfers on the course. We were the THIRD group off of the 18th tee. We waited a lot. The result was a 5 1/2 hour round. Yes, 5 1/2 hours. So that wasn’t awesome. We waited on a lot of shots. When we got to the third tee (our fourth hole of the day), there were already two other groups on the tee. Getting into a rhythm was very difficult. But the golf course really was pretty good. There were a couple of holes that were really wet, but for the most part, things were pretty dry. It wasn’t a muddy mess or a total slop fest. It was also warm enough that I played in pants, a long sleeve golf shirt and a sweater vest and never got cold. Sure beats long underwear, two jackets and a stocking cap. The photo at the top of this post was on No. 17, a par 3 that was our final hole of the day. One of the guys working said that there was a foot of snow on that green earlier in the week. Here are some other photos from the day. Here is Jason putting on No. 2 with the Mississippi River in the background. Yes, it is frozen. There was a little snow here and there, but not really all that much. Here is probably the worst looking bunker of the day. I did hit it in a couple of bunkers, it was like hitting out of mud. Here is No. 17 — the snowiest hole of the day — from the tee. All in all, this was a good day. 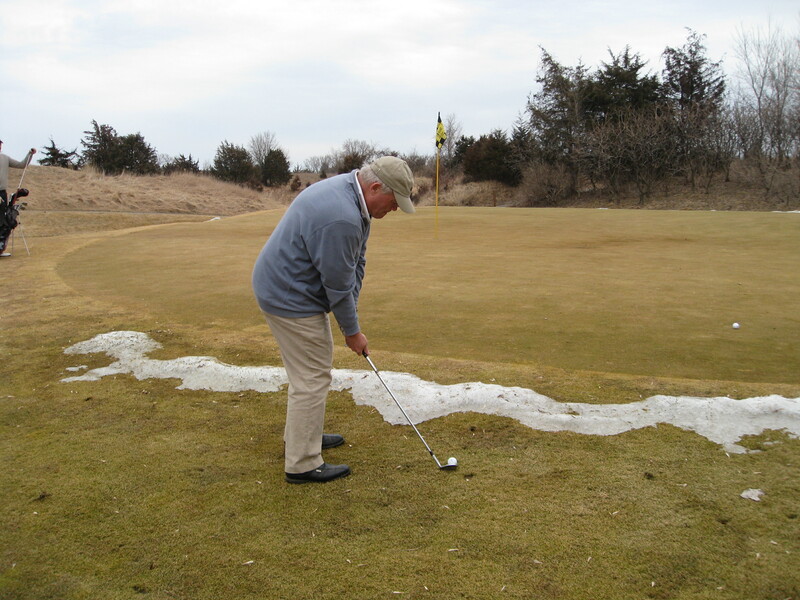 Sure there was a little snow on the golf course. Yes, the pace of play was awful. But it was March 11 and we were playing golf in Minnesota. It’s hard to complain too much. I can honestly say that I’ve never been less annoyed by a 5 1/2 hour round in all of my life. Looking at the 10 day forecast, it appears as if things are only going to get better. The list of courses opening seems to be growing by the day. I would anticipate there will be a lot of St. Patrick’s Day golf. Nice. The best part is you rarely lose a ball this time of year. I’ve played four rounds so far in 2012 here in Chicago. Mostly, it was me and a few deer out on the course. It was so windy last Wednesday I played a drive 60 yards left of the fairway and still watched it blow back right of the short stuff. (Yes, my natural slice played a part in that action.) Walked 18 yesterday, and like you, stopped and started my way through five-plus hours of golf. A little annoying since I can stand around in my backyard for free, but I didn’t mind too much. I was OUTSIDE playing GOLF in SHORTS in MARCH! I enjoy reading about your adventures on the links. Good right up of the course. I definitely understand about the pace of play about the course, but I guess if it were me and I knew it was going to be a full shotgun, I’d treat it like one of the corporate outings I have been apart and be in it for the long hall. Either way it is good to see golfers golfing in early march. The pace didn’t bother me as I was just happy to be out there. But there were a few holes where they started three groups. That’s a bit extreme.